In a bowl, mash up banana. Then add wheat germ and yogurt. Mash all ingredients together and use spoon to add to Kong. Freeze for 4 hours. Just place the 3 slices of cheese directly onto the grooves of your pets Dental Kong (if your model has rope - make sure cheese does not get onto it). Melt in microwave for 20 to 30 seconds. Give to pet after it cools. Place small scraps of the steak inside Kong toy. Spread cream cheese in large hole to hold scraps. Place apples and carrots in Kong toy. Mush banana in large hole to hold fruit in place. You can include other fruits and veggies: orange slices, plums, and/or nectarine chunks, celery sticks, broccoli and/or cauliflower, tomato and black olive mixture. Scramble egg and fold in vegetables. Put in Kong toy. Sprinkle some cheese over the top of Kong toy opening and microwave for about 20 seconds. Cool thoroughly before giving to dog. Melt Cheddar in microwave until gooey. Add Mac N cheese to Kong toy. Pour heated Cheddar into Kong. Make sure it has cooled before giving to your pet. Layer 3: Carrot sticks, turkey or leftover meat. 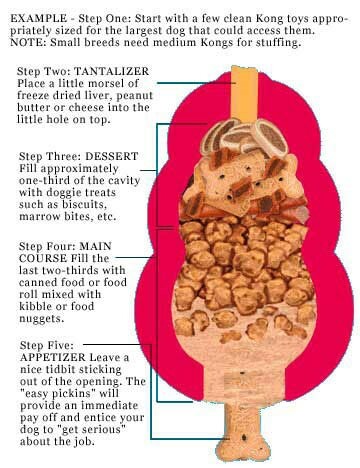 Place the above ingredients inside an inverted Kong (small open should be on the counter) in the order listed above. Pack all ingredients in the Kong as tightly as possible. Serve immediately or freeze for several hours for a longer lasting treat. Take the rope, pull it through the Kong toy and knot it. Hang this upside down from a tree, deck or post. The small hole should be facing the ground. Take the kibble and fill the Kong toy. Make the toy hang just low enough that it is out of your dog’s reach. The dog will spend hours trying to retrieve the kibble from the Kong toy. At the end of the day, take the remaining kibble and give to your pet as a reward. Smear a small amount of peanut butter over small hole in our Kong toy. Fill the toy with cool water and add a pinch of stock. Place a jerky stick inside Kong toy and freeze. This also can be put (once frozen) in a children’s size swimming pool for a fun day of fishing for your pet. Smear peanut butter inside the cavity of your Kong toy. It’s that easy! Try mixing turkey, chicken, or marrow bites with slightly moistened food nuggets. Then freeze inside the Kong. Again, thanks must go to the KONG COMPANY for producing these great food dispensing toys, and for providing these recipes.